With growing conflicts engulfing the Middle East, people in the region name religious and ethnic hatred most frequently as the greatest threat to the world. Moreover, publics across the globe see the threat of religious and ethnic violence as a growing threat to the world’s future. But in Europe, concerns about inequality trump all other dangers and the gap between the rich and the poor is increasingly considered the world’s top problem by people living in advanced economies, including the United States. These are among the findings of a recent survey by the Pew Research Center, conducted in 44 countries among 48,643 respondents from March 17 to June 5, 2014. Across the nations surveyed, opinions on which of the five dangers is the top threat to the world vary greatly by region and country, and in many places there is no clear consensus. Around a quarter of Americans say the growing gap between the rich and the poor (27%) is the greatest threat to the world today, with 24% saying this about religious and ethnic hatred and 23% expressing concern about the spread of nuclear weapons. Fewer say pollution and other environmental problems (15%) or AIDS and other infectious diseases (7%) are the world’s top problems. 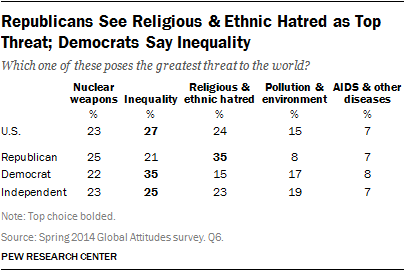 Europeans generally agree that inequality is the top threat to the world. A median of 32% across seven EU nations say the growing gap between the rich and the poor is the top threat and inequality is rated the number one danger in five of these countries. Inequality is cited as the top problem by 54% in Spain and 43% in Greece, countries where the effects of the Eurocrisis have been especially severe. Somewhat fewer in Germany (34%), Italy (32%), Poland (32%) and France (32%) name the growing rich-poor gap. In the United Kingdom, ethnic and religious hatred (39%) is considered the greatest threat, followed by inequality (25%). In Russia and Ukraine, both surveyed after the Russian annexation of Crimea but before months of fighting in eastern Ukraine between Ukrainian and pro-Russian forces, nuclear proliferation is the number one danger. More than three-in-ten say this in Ukraine (36%), while 29% hold that view in Russia. Five of the seven Middle Eastern countries surveyed identify religious and ethnic hatred as the top threat to the world, with a median of 34% across these seven countries saying this, despite the fact that the survey was administered before the Islamic State (ISIS/ISIL) took over large portions of Iraq and Syria and the recent military conflict between Israel and Hamas in Gaza. In Lebanon, 58% identify religious and ethnic hatred as the top threat, the highest level of concern in any surveyed country. Religious hatred is the top concern among Lebanese Christians (56%), Shia Muslims (62%) and Sunni Muslims (58%) alike. But concern about this threat is also prevalent in the Palestinian territories, Tunisia, Egypt and Israel. 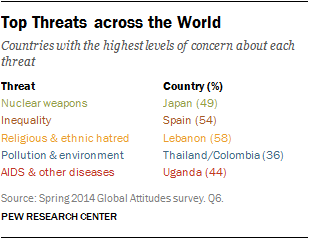 Opinions about top dangers are more mixed in Asia. Three-in-ten or more Thais (36%), Filipinos (34%), Chinese (33%) and Vietnamese (32%) see environmental issues as the main danger to the world. Religious and ethnic divisions rank highest in Malaysia, Bangladesh, Indonesia and India. In Malaysia, Muslims (35%) are more concerned than Buddhists (22%) about religious and ethnic hatred. In Japan, which remains to this day the only population to experience a nuclear attack, 49% say the spread of nuclear weapons is the world’s greatest threat, the highest rating for this issue across the 44 countries surveyed. Three-in-ten in Pakistan, which borders nuclear rival India, say the spread of those weapons is of paramount danger, garnering the highest spot. In South Korea, the gap between the rich and the poor is the largest issue (32%), mirroring findings from many of the other advanced economies surveyed. Latin Americans express mixed views about the top threat facing the world today, but many people in the region name nuclear weapons and environmental issues. Around three-in-ten in Chile (30%), Venezuela (29%) and Brazil (28%) identify the spread of nukes as the world’s top danger. About a quarter in El Salvador (27%) and Mexico (26%) also say this, though in Mexico an equal number name pollution. Colombians, Peruvians and Nicaraguans assess environmental problems as the greatest danger. In Argentina, more say inequality (32%). Africans are generally united in the view that AIDS and other infectious diseases are the top threat to the globe. Africa has the highest rates of HIV/AIDS prevalence in the world and the recent Ebola outbreak has spread in the continent’s west. Ugandans are the most worried about AIDS (44%), followed by Tanzanians (41%), South Africans (35%), Kenyans (29%) and Senegalese (29%). In Nigeria, where Boko Haram terrorists in the restive north of the country are creating havoc, 38% say religious and ethnic hatred is the biggest problem for the world. Taking the median percentages across the 28 countries surveyed in both 2007 and 2014, there has been a shift toward concerns about religious and ethnic hatred as the world’s top problem, especially in the Middle East. Meanwhile, in Europe, more publics now see inequality as the world’s top problem compared to seven years ago, before the Great Recession and Eurocrisis. Overall, in the 28 countries surveyed in 2007 and 2014, religious and ethnic hatred, along with inequality, are seen as the most pressing issues for the world, with the spread of nuclear weapons not far behind. Fewer people within these countries say pollution and AIDS are the biggest threat. However, there have been substantial changes in the top choice within some countries over the last decade. For example, in the U.S., when the question was first asked in 2002 just months after the 9/11 attacks and discussion of the spread of WMDs in the lead up to the Iraq War, a third of Americans said nuclear proliferation was the greatest threat to the world. In 2007, after years of fighting in Iraq and Afghanistan, religious and ethnic hatred became the top concern (28%). And now, six years after the Great Recession, with abundant debates about the growing gap between the rich and the poor, inequality is considered the greatest danger. Europeans have seen a similar progression. 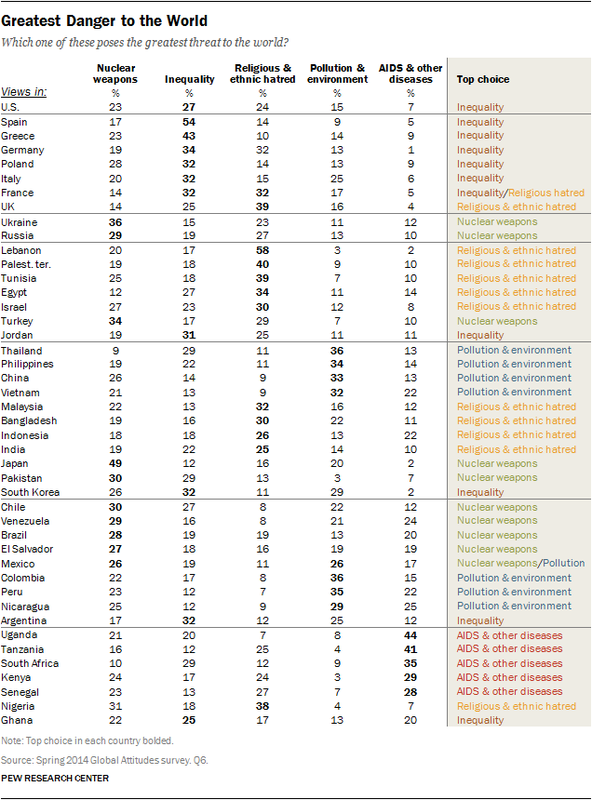 Four of the European countries surveyed in 2007 named religious and ethnic tensions as the greatest threat, but in 2014 all but one say inequality is the top issue (France is split between the two). In Spain and Italy, worries about inequality have doubled since 2007. Meanwhile, Middle Easterners have become more worried about religious hatred. In 2007, a regional median of 24% across six countries named religious prejudice as the greatest danger. By 2014, a median of 32% across those same Middle Eastern countries said this. And in Lebanon, the percentage choosing ethnic hatred jumped 19 points since 2007, while concern has more than doubled in Egypt. Generally, there is little variation by age in views about the top global danger. But in Japan, 18-29 year olds are less concerned about the spread of nuclear weapons than those 50 and older, possibly due to the fact that people under 30 were born at least four decades after nuclear bombs were dropped on Hiroshima and Nagasaki in 1945. Meanwhile, young people in Kenya and South Africa are more concerned about AIDS & disease compared with their elders. In the UK, people on the ideological right of the political spectrum voice greater worries about religious and ethnic hatred, while those on the left are more concerned about inequality. 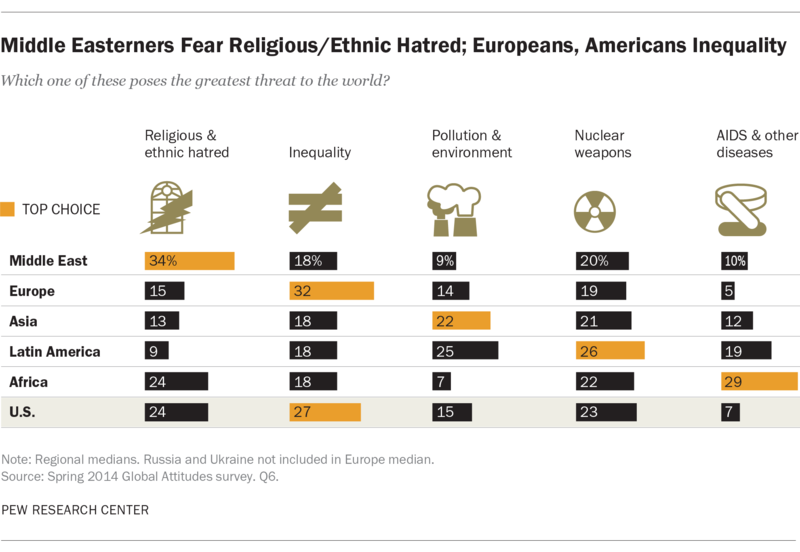 Similarly, in the U.S., Republicans are much more likely to name religious and ethnic hatred as the greatest threat to the world (35%) than are Democrats (15%) and independents (23%). But Democrats are more concerned about inequality (35%) compared with Republicans (21%). Democrats and independents are also more concerned about pollution and other environmental problems compared with Republicans.